French composer; born at Paris May 27, 1799; died at Nice March 17, 1862. His family name was "Levi"; his father, Élie Halévy, was a Bavarian by birth. At the age of ten he entered the Paris Conservatoire and studied under Cazot (elements of music), Lambert (piano), and Berton (harmony). He won the solfeggio prize in 1811, and the second prize in harmony in 1812. He thereafter became a pupil of Cherubini in composition, with whom he remained for five years; and, after twice winning the second prize at the Conservatoire, he finally secured the Grand Prix de Rome (1819) for his cantata "Herminie." Shortly before his departure for Rome his "De Profundis" (text in Hebrew), composed on the death of the Due de Berri, and dedicated to Cherubini, was performed at the synagogue in the Rue St. Avoye (March 24, 1820). 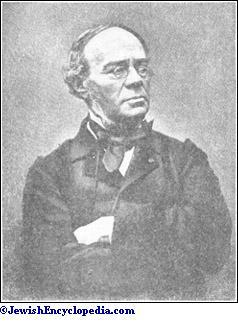 After actively prosecuting his studies in Italy Halévy returned to France, where for several years he experienced considerable difficulty in obtaining a hearing for his compositions. His comic opera "L'Artisan" (in one act), performed at the Théâtre Feydeau in 1827, met with but little success, but the three-act opera "Clari," produced at the Théâtre Italien in 1829, the principal rôle being sung by Malibran, made a somewhat better impression, and was probably largely instrumental in securing for the composer the appointment of "chef du chant" at the theater in question, a position which he occupied in association with Hérold. For several years to come, however, the composer was not destined to score a decided triumph, although opera followed opera in quick succession. Still, the air "Vive, vive, l'Italie," in his comic opera "Le Dilettante d'Avignon" (1829), became exceedingly popular with the Parisian public, while his ballet "Manon Lescaut" (1830), by reason of its melody and verve, also found favor. 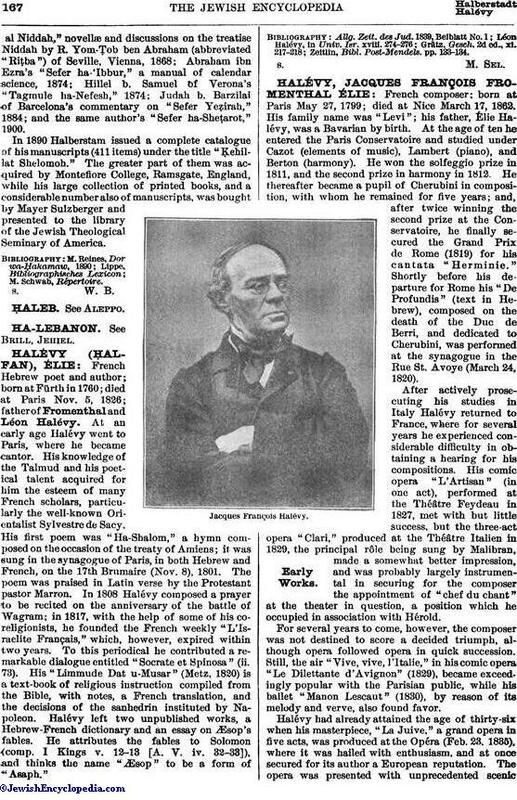 Halévy had already attained the age of thirty-six when his masterpiece, "La Juive," a grand opera in five acts, was produced at the Opéra (Feb. 23, 1835), where it was hailed with enthusiasm, and at once secured for its author a European reputation. The opera was presented with unprecedented scenicsplendor, the stage-setting alone having cost, it was said, 150,000 francs. Ten months after the first performance of "La Juive" Halévy's musical comedy "L'Eclair" appeared; and, although in spirit the exact antithesis of "La Juive," it immediately became a favorite with Parisian audiences. Although the composer had given splendid evidence of his extraordinary talent and versatility in these two widely divergent compositions, he now lost much of his originality and became imitative rather than creative—a deterioration ascribed partly to the influence of Meyerbeer, then at the zenith of his fame, and partly to Halévy's carelessness in the selection of librettos. At all events, it may be said that, out of about twenty dramatic works, chiefly comic operas, which followed upon "La Juive," only a few, such as "Les Mousquetaires de la Reine" (1846) and "Le Val d'Andorre" (1848), are still occasionally produced. Nevertheless, many of them, and notably "La Dame de Pique" (1850), although perhaps lacking in dramatic interest, are replete with melody. 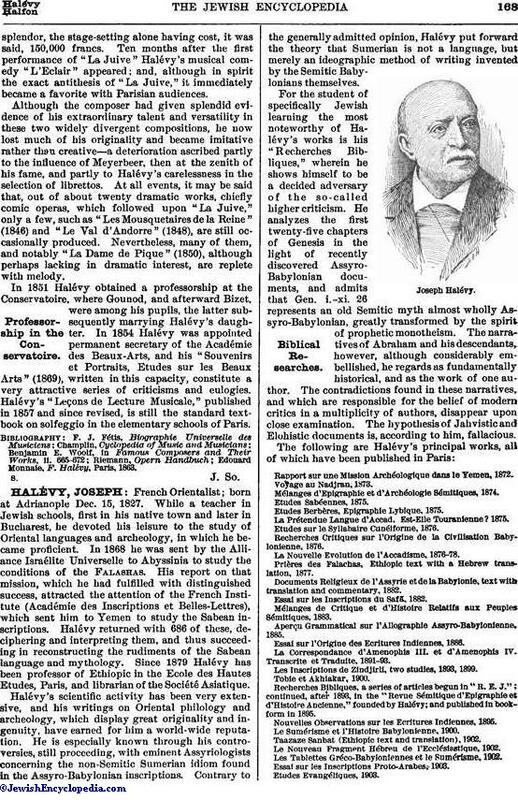 In 1851 Halévy obtained a professorship at the Conservatoire, where Gounod, and afterward Bizet, were among his pupils, the latter subsequently marrying Halévy's daughter. In 1854 Halévy was appointed permanent secretary of the Académie des Beaux-Arts, and his "Souvenirs et Portraits, Etudes sur les Beaux Arts" (1869), written in this capacity, constitute a very attractive series of criticisms and eulogies. Halévy's "Leçons de Lecture Musicale," published in 1857 and since revised, is still the standard text-book on solfeggio in the elementary schools of Paris. Edouard Monnaie, F. Halévy, Paris, 1863.